Hard to say! The Philippines have more than 7000 Islands so there are too many opportunities. How can I give an advise about where to stay, on which of the islands? In fact, you have to find that place by yourself. Most foreigners stay at or near the place where their filipino wife comes from. The family might have a piece of land left for you, where you can settle down, build your little house and make your living. But if you don't want to have the whole family around you all day long you might want to look for a place a little further away. However, be aware that Filipinas mostly want to stay at least in their language region. A Tagalog speaking Filipina from Luzon does not feel very well when she has to live in the Visayas and doesn't understand a word of what the people around her are talking. Trouble ahead! Another big group of foreigners end up at the place where they first landed on their very first holiday in the Philippines. You should really travel around and have a look at different places before you decide where to stay. There is so much to see. ...or ist it better to stay somewhere near the beach like here on Boracay? For myself, the only place where I don't want to stay in the Philippines is any big city in the Philippines. A lot of foreigners tend to stay in cities because they are used to or they like the nightlife, or they found an apartment in the Internet or they think that this is the only place where their kids can go to school. All wrong! Philippine cities are a nightmare for me. They are expensive, dirty, polluted and always have a very high crime rate. Houses in residential areas have high walls around the houses, so you can't even look out. If I would want to stay in a city, I would probably stay back home in Germany but not in the Philippines. When I think about living in the Philippines, I think about white beaches, palm trees, clear water in the ocean and stuff like that. I want to go swimming, diving and do other sorts of water sports. You can't do that in a city. 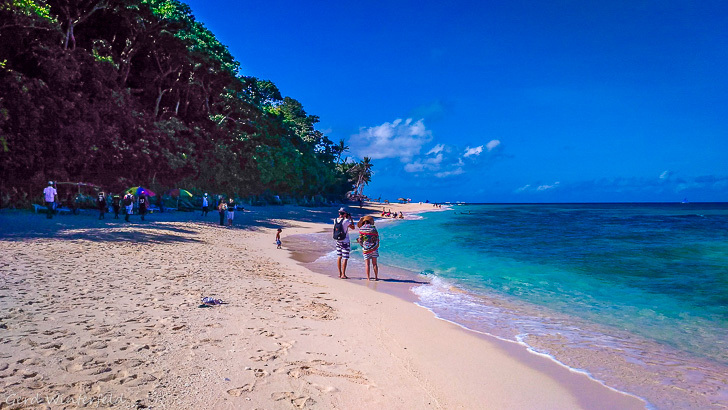 So if I finally would have to give an advice where to stay in the Philippines, I would recommend to look around on the Islands of Bohol, Camiguin, Siquijor, Dumaguete or even Cebu, if you can find something outside of Cebu City. But there are other nice places, too. I just haven't seen them all, yet. Last not least, another place where you maybe don't want to stay is the area of Leyte. Leyte is nice but it's always hit by typhoons and really bad weather. So if you don't want to rebuild your house every year, don't stay in Leyte!